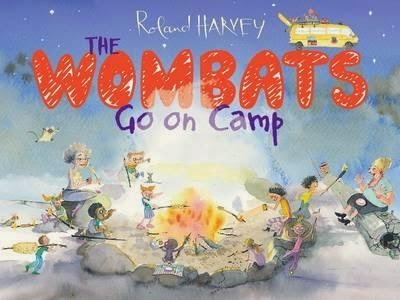 The Wombats Go on Camp is an engaging and exciting book about a group of students and their teachers going on camp. The characters tell us in first person all about their experiences, and their favourite or least favourite parts. It begins with one character, who may mention something about another, leading to another point of view. They tell us about their adventures on the road, at camp, in the kitchen and in the process of preparing a class play. The text used is in a handwriting style, showing each character’s opinion. The illustrations are interesting, and all of the characters are in each picture so we can see what they are doing. This picture book is quite long but there was never a boring moment because the reader’s attention was kept throughout the whole book by using bright and colourful illustrations. All the characters are unique and unusual, not generally your average child. They have a large variety of opinions and speak in a very opinionated way, whether it be about people they like or people they don’t like. I highly recommend this book because it is interesting and exciting. I would rate this book 8/10 because it is original and humorous.